Dr. Tasuku Honjo, a Japanese immunologist and one of the distinguished Honorary Members of the Japan Biochemical Society (JBS), was awarded the Nobel Prize in Physiology or Medicine in 2018 together with Dr. James P. Allison (USA). 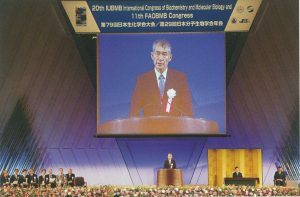 Photo above shows Dr. Honjo delivering his presentation at the 20th International Congress of Biochemistry and Molecular Biology and 11th FAOBMB Congress in Kyoto, 2006, in the very presence of His Imperial Highness, The Crown Prince of Japan. Dr. Honjo has established the basic framework of class switch recombination, a mechanism that changes types of immunoglobulin produced in B cells, such as from IgM to IgG. In 1986 he identified cytokines IL-4 and IL-5. In 2000 he identified activation-induced cytidine deaminase (AID) that is indispensable for class switch recombination and somatic hypermutation. Dr Honjo also discovered Programmed Cell Death Protein-1 (PD-1) in 1992. PD-1, a checkpoint receptor, is induced on surface of activated T-lymphocytes and negatively regulates the cell. He showed that modulation of PD-1 has significant effects in the treatment of viral infection, cancer and autoimmunity. This discovery led to establishment of cancer immunotherapy by blocking the T-lymphocyte brake, PD-1. For these outstanding contributions to the field of immunology and cancer therapy, he was awarded the Tang Prize in 2014, the Kyoto Prize in 2016, the Alpert Prize, the Japan Bioindustry Award in 2017 and the Nobel Prize in 2018. “When I am thanked by patients who recovered from serious illnesses, I truly feel that our research is significant.” Dr. Honjo commented in the interview soon after he won the Nobel Prize. Dr. Honjo was born in Kyoto. He received his M.D. degree in 1966 and Ph.D. degree in Medical Chemistry in 1975 from the Faculty of Medicine, Kyoto University. He was an assistant professor at the Faculty of Medicine, University of Tokyo from 1974 to 1979. During this time, he was also a visiting fellow at the Department of Embryology, Carnegie Institution of Washington from 1971 to 1973, and then moved to the U. S. National Institutes of Health (the National Institute of Child Health and Human Development) from 1973 to 1977. He became a professor in the Department of Genetics, Osaka University School of Medicine from 1979 to 1984, a professor in the Department of Medical Chemistry, Kyoto University Faculty of Medicine from 1984 to 2005, and a professor in Department of Immunology and Genomic Medicine, Kyoto University Faculty of Medicine from 2005 to 2016. Since 2017, he has been Deputy Director-General and Distinguished Professor of Kyoto University Institute for Advanced Study (KUIAS). Dr. Honjo has been an Honorary Member of JBS since 2006. He was the President of the 20th International Congress of Biochemistry and Molecular Biology and 11th FAOBMB Congress in conjunction with 79th Annual meeting of the Japanese Biochemical Society in Kyoto in 2006. He delivered a Plenary Lecture “Amazing Power of the Immune System” in the 90th Annual meeting of the Japanese Biochemical Society (ConBio2017) and the 26th FAOBMB Conference in Kobe. 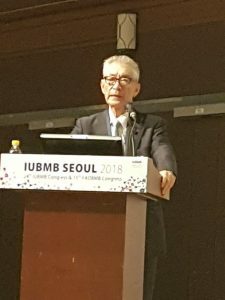 He delivered the Tang Prize Lecture at the 24th International Congress of Biochemistry and Molecular Biology and 15th FAOBMB Congress in Seoul, Korea, in June 2018. Photo above shows Dr. Honjo delivering his Tang Prize Lecture at the 24th International Congress of Biochemistry and Molecular Biology and 15th FAOBMB Congress in Seoul, Korea, 2018.